Manufacturing - Anfarm Hellas S.A.
ANFARM’s Manufacturing Plant holds an EU GMP Manufacturing License from the Greek Health Authorities and is accredited from several National Health Authorities worldwide. The Plant is located at the Schimatari industrial hub, at the 61st km of the Athens-Lamia National Road. The Manufacturing Plant has undergone numerous revamps and expansions in order to be kept aligned with the highest production and manufacturing specifications and in accordance with EU GMP standards, providing, at the same time, a modern pharmaceutical manufacturing environment. 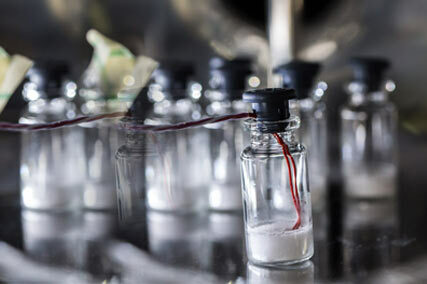 ANFARM’s Manufacturing Plant comprises of two warehousing units, a separate and dedicated unit for handling β-lactam sterile powders and oral solid dosage forms, and a third unit for manufacturing large and small volume liquid injectable and lyophilized products as well as conventional non-sterile pharmaceutical products such as oral solid and liquid dosage forms. ANFARM’s state-of-the-art manufacturing infrastructure and capabilities coupled with an exceptional team of R&D scientists provide the assurance of a smooth transition from lab to commercial scale, as well as in-depth scientific know-how for tech-transfers.